solutions for print and web. •	Where we take pride in being perfectionists. but the left-brain isn't forgotten. •	Where reliability and customer service come naturally. 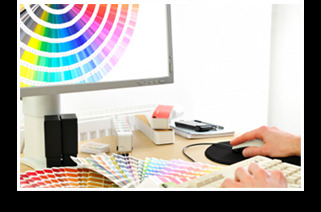 We are professional graphic designers who have been in the industry since 1995 and have loved every minute of it! We are passionate about art, and we are committed to staying on top of the latest trends and newest techniques. We help businesses of all sizes develop marketing materials that they are proud of and that make them money (or save them money) in the long run. At G4G, we love watching our clients grow, so call us at 336.510.7467 or e-mail us at info@g4ginteractive.com to see how we can help your company get to the next level! Logo redesign & complete corporate rebrand for Tri-State Steel. Click here for more Before & After designs. Website design for Dr. Scott Welch D.D.S. Click here for more website designs. Brochure design for Ford Motors. Click here for more brochure designs. Full page advertisement for Varrow. Click here for more advertisement designs. Two sided postcard for OVO Studios. Click here for more postcard designs. Presentation folder for Alpheon. Click here for more presentation folder designs. Full page advertisement for Association Management Group. Click here for more advertisement designs. Brochure design for 1st Step Pro Wellness. Click here for more brochure designs. Full page advertisement for DLH Nordisk. Click here for more advertisement designs. Flyer redesign for Neighborhood Gold Exchange. Click here for more Before & After designs. Two sided postcard for Chadwick Insurance. Click here for more postcard designs. Website design for Pinnacle Benefits Group (as employee) Click here for more website designs. Sales sheet design for The Usability Team. Click here for more sales sheet designs. Book cover design for Edmund R. Schubert. Click here for more book cover designs. Business card design for MASE. Click here for more business card designs. Vehcile wrap for Association Management Group. Click here for more vehicle wrap designs. Postcard redesign for Quality Services. Click here for more Before & After designs. eNewsletter design for Varrow. Click here for more eNewsletter designs. Brochure design for Envision-4D. Click here for more brochure designs. Website design for Alliance Commercial Property Management. Click here for more website designs. Catalog design for All-State Restaurant Equipment. Click here for more catalog designs. Brochure design for Mid Atlantic Health Care. Click here for more brochure designs. Custom designed wedding invitation using Letterpress printing. Click Here for more custom invitation designs. Business card design for Tri-State Steel. Click here for more business card designs. Website design for Mark Holder Jeweller. Click here for more website designs.
. . . : : : Click the text links or photos above to read more about our Creative Services : : : . . . Call us at 336.510.7467 or e-mail us at info@g4ginteractive.com for more information.